Fri., June 1, 2018, 12:46 p.m.
LONG POND, Pa. – Kyle Busch tossed his son into the air at Texas. Clint Bowyer waited for his toddler to run toward him with open arms at Martinsville. Kevin Harvick rested his hands on his son’s shoulders as they gazed at a trophy in Atlanta. Hey, who says the young kids in NASCAR can’t celebrate in victory lane? OK, in the sagging sport’s version of that story, it’s the ballyhooed youth movement that would have paid dividends with checkered flags and publicity bursts as NASCAR nears the halfway point. But NASCAR is still very much a veteran driver’s game. Ryan Blaney and Chase Elliott each won qualifying races in Speedweeks for the Daytona 500, seemingly setting the stage for the new generation to take the reins in 2018. And who won the pole for Daytona? Yup, 25-year-old Alex Bowman in his debut race for Hendrick Motorsports. The sizzling starts haven’t carried over as the season nears the midway point. Elliott, winless in 90 career starts, has three top-five finishes this season. Bowman, 0 for 94, has just one top five in ’18. Bowman finished a solid ninth last week at the Coca-Cola 600 in his best career finish on an intermediate track. Bowman said he hasn’t felt stress from replacing the retired Dale Earnhardt Jr. in the No. 88 Chevrolet. But rather, the burden comes from failing to bring home trophies for one of the most storied organizations in NASCAR history. As the series shifts to Pocono Raceway, Blaney’s win for the Wood Brothers last June marked the last time a driver won his first career Cup race. Sure, there have been close calls and blown leads and bad breaks. Darrell Wallace Jr., Erik Jones, William Byron, the list goes on of 20-something drivers stuck with the 0 in the win column. It’s rare at Pocono for a driver to break through for his first career Cup victory. Jeremy Mayfield (June 1998), Denny Hamlin (June 2006), Chris Buescher (August 2016) and Blaney all scored their first wins on the tri-oval track nestled in the mountains. Blaney’s win ended a five-race stretch last season that included first-time winners Ricky Stenhouse Jr. and Austin Dillon. Stenhouse and Dillon, the 2018 Daytona 500 champion, each won again. The rest of the list reads like much like it has for most of the last five years; Harvick and Busch, Martin Truex Jr., Brad Keselowski and Denny Hamlin headline the drivers with multiple victories since last June. The 42-year-old Harvick and 33-year-old Busch, each former series champions, have nine of the 13 wins in Cup this season. The veterans aren’t ready to pass the torch. The so-called young guns are still shooting blanks. Wallace, who made his first career Cup start last June at Pocono, energized the sport when he finished second this year in the Daytona 500 for the best-ever finish in the race for a black driver. He hasn’t finished better than 16th in any of his last five races. Wallace said the struggles from the budding stars could be pinned on more than inexperience. Dillon won Daytona in a Chevy – the only one for the manufacturer in its first year using the Camaro. Seven-time champion Jimmie Johnson is riding a career-worst losing streak in the No. 48 Chevy and Kyle Larson, with five career Cup wins, are among the winless veteran Chevy drivers. Johnson, though, needed only 13 starts before he won his first Cup race, Harvick won in just his third start and Busch won two races his rookie year. The O-fer streak won’t last forever. So who’s next to crack the first-timer club? Elliott, son of NASCAR Hall of Famer Bill Elliott, is the obvious choice. He had five runner-up finishes last season and was second this year at Richmond. Bowyer, Busch, Dillon, Harvick, Joey Logano and Truex are locked into NASCAR’s playoffs with their wins. Bowman, Jones and Elliott are teetering on making the 16-driver field and could use that victory to make the playoffs. Jones said his Joe Gibbs Racing team was on the cusp of a checkered, with the caveat of a perfect race. 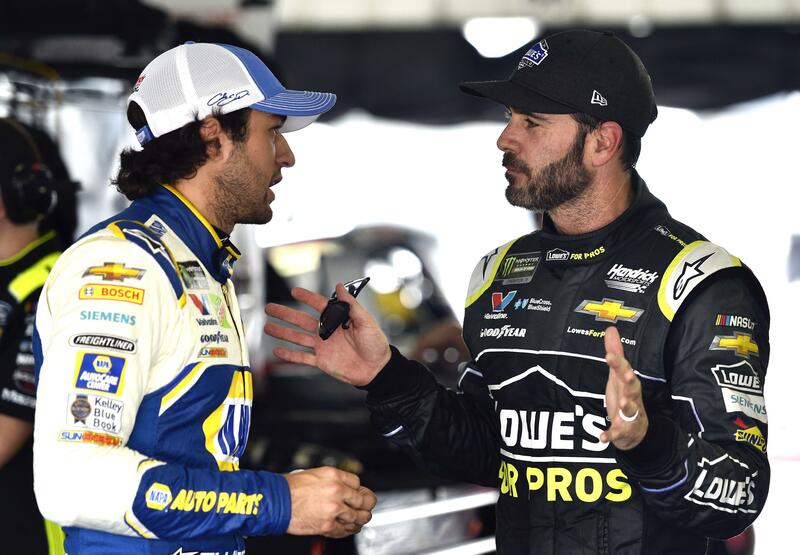 “We need to qualify in the top 10 for sure, and then have a great race, not make any mistakes, no mistakes on my end, no mistakes in the pits, and eventually those things are going to work out,” he said. But the wait goes on. Published: June 1, 2018, 12:46 p.m.